Heat oven to 350°F (325°F for dark or nonstick pans). Spray bottoms and sides of two 8- or 9-inch round cake pans with baking spray with flour. Make batter and bake cake as directed on box for 8- or 9-inch rounds. Cool 10 minutes. Remove cakes from pans to cooling racks. Cool completely, about 1 hour. On serving plate, place 1 cake layer, rounded side down. Frost top of cake layer with about 1/3 cup frosting. Top with second layer, rounded side up. Frost side and top of cake with remaining frosting. 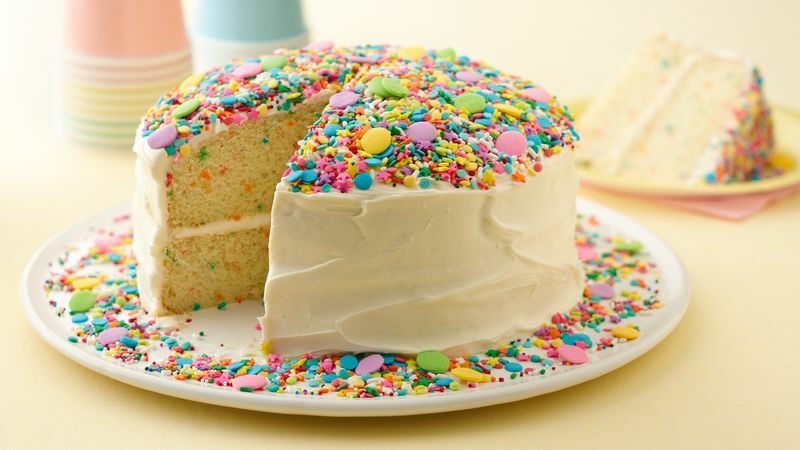 Top with candy sprinkles. Store loosely covered. You can bake and freeze the cakes ahead of time. Just wrap tightly with plastic wrap, and place in airtight container.